I rest my case. I'm not responding to the triggered shill though. LOL... I liked your comment to give you some support, poor guy. You might find, though, that wearing a tinfoil hat all day will leave you with hat-head which is unbecoming. BTW... I thought you were launching a major lawsuit against WR. Of was that just bravado... you know, whistling past the graveyard as it were? Relax. Life is so much bigger than a non-working pw mgr. Go outside. Smell the flowers. Pet a dog. Drink some coffee. Get LastPass and install it. It actually works and you won't need to wring your hands so much anymore. In fact, mine is working so well, I'm going to fork over the $24 for the Premium so I can have it on my smartphone as well as my tablets and laptop. Wrong on both counts: 1) the people commenting here do not work for WR and 2) the commenters here are not "shills" as you put it. We're simply people who face the same problem but exhibit more patience and understanding. You, on the other hand, appear to have anger management issues. Open support tickets on this, ask them what the deal is. Some of the people commenting here make it sound like they work for Webroot, but they don't and are defensive shills. I'm just curious if there has been any new feedback. We are nearing the middle of February. I'm fine with another delay, but I would like some transparency. Thanks! So, now that the "new community" is up and running... any chance somebody will fix the damn password manager plugin? 6-8 WEEKS is a stupid long period of time to wait. Unfortunately, the end that I'm seeing increasinly in sight looks like BitDefender. No company can keep ignoring their customers' concerns about any part of their product and expect to retain those customers. If you are saying in the above not only where you personally are headed in terms of your cybersecurity protection but where you think Webroot is headed as a company, I think that's a bit extreme. Webroot's core product, its AV engine, is just too d*mn good for the whole company to go down as a result of its problems with its Password Manager. However, I do think that this (almost never-ending :() Password Manager incident is symptomatic of a deeper malaise, one that I've been grousing about for some time: the problem of the general mediocrity (indeed, in some cases not even fit for purpose :@) of all those bits that I call its "bells and whistles" (System Optimizer excepted!). With this incident, the chickens have well and truly come home to roost. When eventually Webroot comes out with its new Password Manager (which I am very much hoping will be the beginning of the reversal of this pattern :8), it would be interesting if we were ever allowed to see the statistics of how many people had abandoned Webroot as a result of that sad fiasco. Interesting also, if Webroot decides not to be totally generous in offering discounts/partial reimbursements to those who have had to put up with an only partially functioning suite, to see how many will go on to subsequently abandon their product. Secure web for your phone now has black writing on a black background. I spent an hour on the phone with tech support and he said the phone issue isnt' that big a deal and the password manager will be fixed but they have no idea when and that Webroot is an antivrius, not a password manager so he insinuated it's a luxury. If that is a fair and accurate summary of the Support technician's words, then I believe it betrays an incoherence in Webroot's policies. On the one hand, they market their products in such a way as to say that their Antivirus product is the basic version, but the Internet Security Plus and the Internet Security Complete suites are the more complete and superior versions. On the other hand, they are saying "Webroot is an antivirus" and the rest is "not a big deal" or "a luxury". Remember when they discontinued the very useful Windows Washer and substituted it with a tool that you have no control over as to what it's cleaning? That was a Webroot mistake too. BD is more expensive, generally (until you add in the VPN product, which, from Webroot, is pricey), but they seem to have sensed blood in the water here, because their current offer is aggressively competitive with Webroot. My password manager won't even show up if I go over FF56. It used to autofill and generate passwords. It never works anymore. 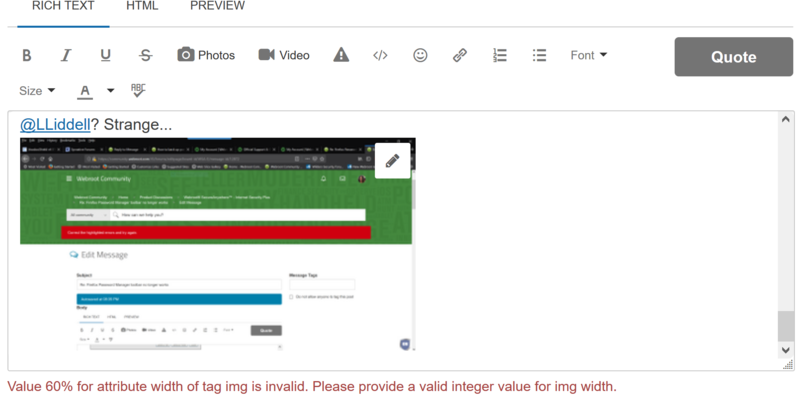 I get an error if I try to access through my webroot. Secure web for your phone now has black writing on a black background. I spent an hour on the phone with tech support and he said the phone issue isnt' that big a deal and the password manager will be fixed but they have no idea when and that Webroot is an antivrius, not a password manager so he insinuated it's a luxury. I see no end in sight. 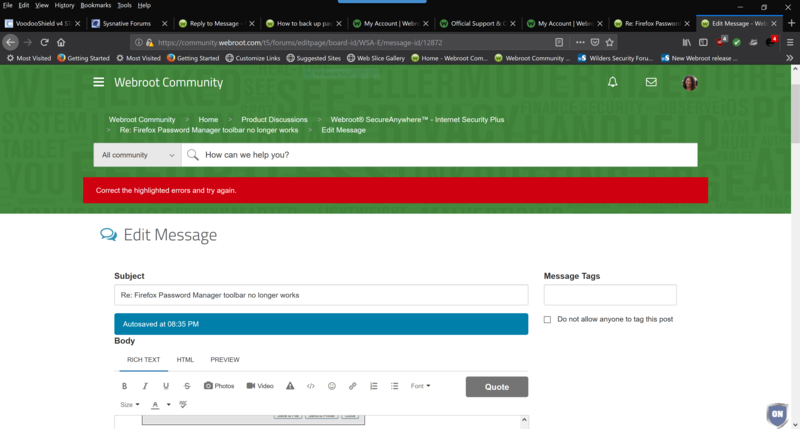 My subscription is up in a Month and my renewing it pretty much depends on how honest and honorable the suits and ties and skirts are at Webroot...The lack of communication and the lack of concern on Webroot part is quite alarming. Robert, it is that word “honour” that in a strange kind of way chimes with me. I never thought I’d say this but … despite the fact that I still believe Webroot offers the best malware protection out there, I nevertheless find myself questioning whether I feel comfortable continuing with Webroot as my AV. There are several factors that are pushing me to question my loyalty. It’s not just the Password Manager issue and in particular the way Webroot has been handling its communications (or, rather, its non-communication) with customers regarding this problem—though certainly their apparent “lack of concern” regarding this issue does trouble me—rather that issue has been one of several issues that seem to be symptoms of a wider attitude and corporate culture that I, like you, find “alarming”. When WSA was Prevx, in every respect the way they behaved seemed to communicate loudly and clearly that the customer was at the very centre of their whole business outlook. It sadly no longer feels that way. I hope I shall find opportunities in different ways and through different posts in the near future to illustrate why I feel like this. I don’t know how all this will play out for me. It may well be that I will continue with Webroot. But I fear that something sacred has been lost. And as a result it may be that, at the end of the day, I will be prepared to make some sacrifices in the area of robustness of protection if I can find another security company that values the customer more than Webroot appears to. Is there any update as to the progress on resolving this issue? I keep getting warnings from Firefox about the browser being out of date. Really, when you think about it, a program that is designed to promote security is causing many to take risks to be able to access their passwords. Unbelievable that this has gone on so long I'm not sure what is going on but it's supposed to to be a better Password Manager when said and done. Sorry for the inconveniences.. Which doesn't say much when Firefox is wanting you to update for security reasons . etc.. Seems like there's something wrong with the HTML code on Lithium's end. I'll message you to get more details. It mentions highlighted errors. What fields did it highlight? Sorry to hear you are having these issues. Webroot Support can help you with your Webroot subscription. Okay? Hopefully they can assist you in your Password Management Console. Why Thank you so much. It's so refreshing to hear something nice once in awhile . We appreciate your patience & understanding through all of this.